June 9, 2018 at 5:55p.m. Twelve unique ukuleles, painted by four Mahoning Valley students, will go on display Wednesday at Hubbard Music’s store in Eastwood Mall. 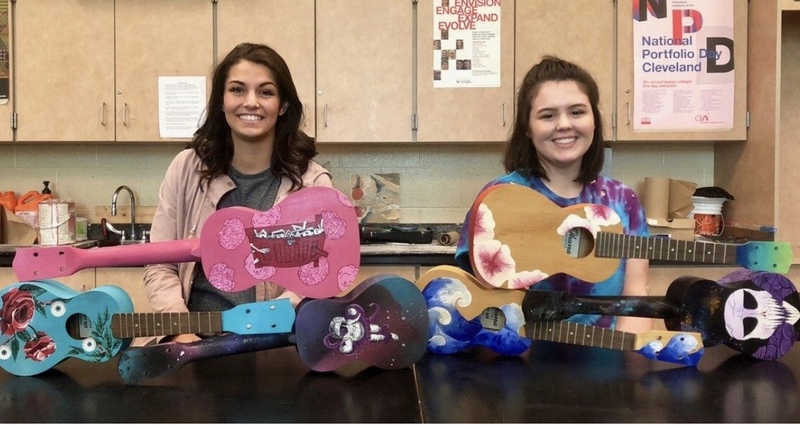 The students – Taylor Begeot and Hannah Best of Hubbard High School, Alissa Rodgers of Lakeview High and Zion Jones of Liberty High – were each presented with four ukuleles and given free rein to paint and decorate them. The students were selected by their art teachers: Josh MacMillan, Hubbard; Jeff Piper, Lakeview; and Sarah Frank, Liberty. The ukulele project was started by Hubbard Music owner Mark Tirabassi as a way of calling attention to local talent, and also the unique instruments, which his store sells. The students will get to keep one of the ukuleles they decorated; the remaining nine will be displayed and offered for sale at the store. The ukuleles will be unveiled at 10 a.m. Wednesday, and the four students and their art teachers will be on hand. There will also be unfinished ukuleles for sale, for those who want to decorate them. Hubbard Music will clear coat any ukulele it sells after it is painted. June 16, 2018 8:09 p.m.
June 16, 2018 5:14 p.m.
May 30, 2017 10:28 p.m.